Any chance we can instead get those in an open format? HTML 5 and an open video format would be awesome! Why would you choose a format that requires a plugin at all, over something like HTML5 video? I’m sorry to pile on, but I must agree with what the others are posting. It was what I was going to mention before I saw the other comments. Flash is fine but dated, doesnt work on mobile devices. Can you tell us why HTML5 was not used? I’m sure it was discussed. I have to agree with the other comments here that using an h.264 video that can be played by Flash & non-Flash players would have been a better choice. Especially since it looks as though the platform provider you chose, VMix, has an HTML5-ready solution: http://www.vmix.com/html5.php. Since I was a small boy I supported and followed NASA with great anticipation, amazement and enthusiazem. I was born the same year NASA was founded. (1958) I am currently deeply concerned and fearful in reguards to the future of NASA’s manned space flight program. With that said I do really like the new page layout. 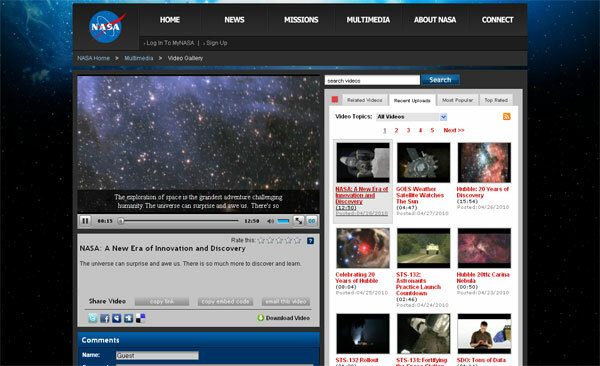 Sad NASA’s manned space flight missions will soon be missing from the new page. I do wish however there could be a high definition option for the remaining video feeds. I wish the best for all of you at NASA.